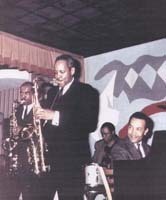 Sonny Stitt on sax, Harold Layne on drums and Sir Charles Thompson on piano at Connelly’s Jazz Club on Tremont Street. (circa 1962) Courtesy of Harold Layne. Boston is not the first place that comes to mind when people think of jazz. One might think of New Orleans or Chicago or New York. But Beantown? Ask any Boston jazz musician and they can name not just the clubs but the locals who made the scene big: Johnny Hodges, Harry Carney, and Paul Gonsalves, who all went on the play with Duke Ellington; Sonny Stitt; Alan Dawson; and bandleader Sabby Lewis, among others. But what, specifically, was the Boston sound? Boston played everything and that’s part of the problem in placing Boston within a specific jazz tradition. “Boston was a great meeting place,” said Thomas O’Connor, Boston historian and professor at Boston College. “But I don’t think Boston promoted a unique style.” As the style of jazz changed, Boston musicians excelled at the new forms, from traditional jazz to swing to bop to avante garde. Banulis also pointed out that Boston’s radio signal did not travel far outside the area. The signal only reached the greater Boston area, unlike Philadelphia, Chicago and New York where the radio reached a wider audience. The loss of great jazz journalists to New York was another factor, he said. In the 1960s, many jazz players left for New York and many writers left with them, including Nat Hentoff and Ray Barron. “This exodus hurt the telling of the story,” he said. “New York is the place for jazz, always has been and always will be,” said Rusty Scott, piano player, while on a set break at the Wonder Bar in Allston. “But Boston is close enough to New York that we get a lot of spillover.” Jazz musicians on their way to New York or playing in the city frequently pass through Boston.